What did they find for vaccine preventable diseases? Autistic kids are 3 times more likely to be hospitalized for vaccine preventable diseases than are kids with no chronic conditions. For diseases that can be easily prevented with vaccines. But sadly some of the most vocal opponents to vaccines are autism parents. All due to the misinformation that claims that autism is caused by vaccines. And the result is that autistic kids suffer from preventable diseases. Not only do these parents contribute to the misinformation campaign against vaccines, they also ignore the fact that other conditions are even more common among autistics than, say, GI disease. Not to downplay GI disease. Not at all. From this study, hospitalization from constipation occurred in 1.2% of autistic kids. That’s over 4 times higher than for kids without chronic conditions and that’s a big deal. But what fraction of autistic kids hospitalized for mental health conditions? 23.5%. That’s over 8 times more often than kids without chronic conditions. And nearly 10 times more common than hospitalization from constipation and gastroenteritis combined. 14.5% of autistic kids were hospitalized for epilepsy. Nearly 10 times the value for the general population. But as a community, autism parents are not talking about mental health conditions and epilepsy much. The most vocal among us have let themselves focus on the (now dead) vaccine debate. And it is hurting us as a community. It is hurting the people we are supposedly working to serve: autistics. Yes, autistics are more likely to be hospitalized than are the general population. And big issues for us include mental health and epilepsy. Hospitalization–any hospitalization–is a big deal. Especially in the autistic population. Not too long ago we saw that autistics were more likely to be restrained in the ER. I remember being left overnight in the hospital when I was a kid. No way I could do that with my autistic kid, and I don’t see being left alone as a viable option for many of the autistics (both kids and adults) I know. How do we support autistics (and other disabled people) when hospitalized? From my experiences, I can say “not well”. And that’s something I hope we can change. I hope enough people read past the vaccine part of this article and take the time to really think about where we are applying our advocacy in the autism communities. Background: “Ambulatory care sensitive conditions” (ACSCs) are conditions for which appropriate outpatient care prevents or reduces the need for hospitalization. Children with autism spectrum disorder (ASD) may be at risk for hospitalization for ACSCs because of difficulty accessing high quality primary care. Objectives: The purpose of this study is to describe the prevalence and health care utilization of children with ASD who are hospitalized for ACSCs and compare them with the prevalence and health care utilization for the same conditions in hospitalized children without ASD. Methods: Using the 2009 Kids Inpatient Database, hospitalizations for an ACSC were examined within three cohorts of children aged 3-20 years: children with ASD, children with chronic conditions without ASD (CC), and children with no chronic conditions (no-CC). 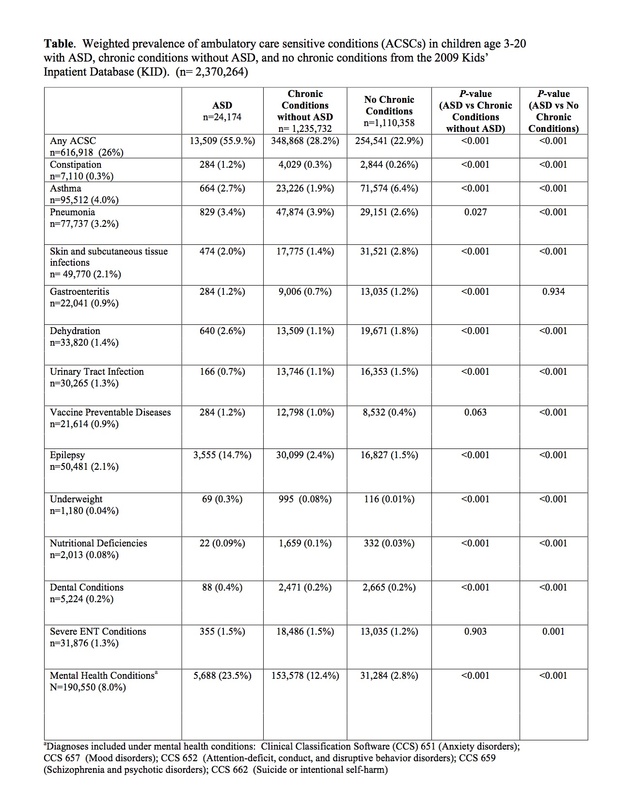 In order to compare the prevalence of each ACSC for the three cohorts we separately analyzed discharges with a primary diagnosis ICD-9-CM code that corresponded to each of ACSCs listed in the table. In order to compare inpatient health care utilization for the three cohorts we analyzed total charges (TC) and length of stay (LOS), for each ACSC. Results: Within the 24,174 in the ASD cohort, we found that the proportion of hospitalizations for an ACSC was 55.9%, compared with 28.2% in the CC cohort and 22.9% in the no-CC cohort (p<0.001). The most prevalent ACSCs among children with ASD were mental health conditions (e.g. anxiety, depression, mood disorder) (23.5%) and epilepsy (14.7%). Children with ASD were more likely to be hospitalized for a mental health condition, epilepsy, constipation, dehydration, underweight and a dental condition compared with the other cohorts (Table). After adjusting for covariates (age, gender, race, median household income, primary payor, hospital variables [size, location region, teaching status, type] and point of origin of admission), we found that children with ASD were nearly ten times more likely to be hospitalized for a mental health condition (OR: 9.72; 95% CI: 8.39-11.26; p <0.001), nearly seven times more likely to be hospitalized for epilepsy (OR: 6.58; 95% CI: 5.95-7.29; p <0.001) and more likely to be hospitalized for constipation, pneumonia, dehydration, vaccine preventable diseases, underweight and nutritional deficiencies, compared with the no-CC cohort. Adjusting for the same covariates we found that children with ASD were twice as likely to be hospitalized for mental health conditions (OR: 2.19; 95% CI: 1.99-2.41; p <0.001), five times more likely to be hospitalized for epilepsy (OR: 4.99; 95% CI: 4.60-5.41; p <0.001), and were significantly more likely to be hospitalized for constipation, dehydration, and underweight compared with the CC cohort. The ASD cohort had higher TC and longer LOS for mental health conditions compared with the other two cohorts. Conclusions: Outpatient efforts to prevent hospitalizations in children with ASD should focus on mental health care needs and seizure management. Other strategies should include actively managing constipation and dehydration, monitoring nutritional status, and immunizing against vaccine preventable conditions. Understanding the reasons for the higher healthcare utilization among children with ASD hospitalized for mental health conditions should be the subject of further research. I wonder how much of the high rate of hospitalization is due to communication difficulties? A child without communication difficulties may be able to communicate symptoms earlier, leading to earlier treatment that treats or mitigates the issue; while a child with some impairment in communication may not be able to express their discomfort until the issue has advanced to the point that hospitalization is required. I would agree. I’ve heard stories of adults who say exactly that. Even though they can communicate, maybe through typing…they don’t have the body awareness, either, and may not put it all together until they are very ill. Let alone a child who has no ability to tell what is wrong. I’m taking a chance putting my opinion out there…You always been kind, I hope you don’t change. When I read this, I am thinking, YES. It’s the fragility, medically, of our kids and especially kids with epilepsy, who are more prone to severe vaccine reactions. Not that they shouldn’t get vaccines, or the vaccine caused their autism. It’s that it is often a sign or early clue that something is awry. For a time, I studied Tuberous Sclerosis because we couldn’t afford the genetic testing, Ben is adopted, and there are serious medical repercussions that might make it good to know. Often, one of the first signs is a reaction to the DTP. Now dammit, listen and don’t go off on me. When we refuse to listen to Mom’s who try to tell us what they saw, and instead go off on how crazy they are, it sure as (french) ain’t science. I think we are just getting to the point that we can accept that certain, especially neurological anomalies are first indicated by reaction to vaccines, mainly because their genetic (usually) disease is immune related, or compromises brain function in some way. That ain’t woo.That’s science.And the thing is, it may be a clue to the etiology. I’ll go to my underground bunker now until the storm passes. No one “refuses to listen to mom’s who try to tell us what they saw” and no one “go[es] of on how crazy they are” here. I’m unsure why you chose those terms here. People have and do listen to parents who claim that they saw a vaccine reaction. But often people say that their kid’s autism is a vaccine reaction and then those parents don’t listen to the data that says this isn’t likely (to the point of not being an accurate observation at all). Which is to say, you are pointing the finger at the wrong people when it comes to not listening. As to epileptics being more prone to vaccine reactions, perhaps if you provided us with some data to support that claim we could discuss it. In the end, seizures can be triggered by infection and/or fever. I’ve seen first hand a kid who has terrible seizures due to infection. No idea how bad it would be with a very serious disease, like those prevented by vaccines. And I am very thankful for that. Yes, the old whole cell pertussis vaccine led to more reactions. Febrile seizures being one. Febrile seizures are not epilepsy and not autism. And the vaccine is no longer given. I don’t see the point of this article in this discussion. I am thankful, too. I am so safety oriented, I didn’t even give my son aspirin for fear of Reyes. He received all his vaccines but Chicken Pox, he had the disease. I think everyone should vaccinate their kids, with the exception of those who have acceptable medical exemptions. My son is no longer one of them. This is my last post, my last hurrah…if the DTwP my son received, which, was 99.9999% safe (I am just guessing) at the time using the current 1 in a million safety record used today by dividing the number of vaccines given out by the number compensated, why did they change a 95% effective vaccine to a 70% effective one? Most kids who develop Pertussis…are vaccinated, at least in pockets. It was changed for a reason, and we may never know exactly. Doesn’t that make those decision makers responsible for the rise in Pertussis? I know there is a convoluted message that blames it on non-vaccinated, but adults are the most frequent carriers of Pertussis according to some. How can everything be blame on non-vaccinators, a group to which I don’t belong….? Even when vaccines lose 25% of their effectiveness, it is the fault of the non-vaccinators. Where are the grown-ups? It was changed because the old, whole cell, vaccine was leading to more reactions. And people–including some of those now voicing strong opinions against vaccines–lobbied hard for a change. And yet my son’s seizures were as an infant before he had any vaccines, and a bit over a year later when he had a now vaccine preventable disease. Do tell us how those who have autism get more seizures from vaccines than the actual diseases. Because I’ve seen it with an actual disease, not any vaccine. Then there was his second to the last hospitalization where he had a complex migraine that looked just like a stroke, including speech issues, etc. That was not fun. At least the last time he was in a hospital was for open heart surgery. Even so, he is still more vulnerable than others to diseases. Due to the scar tissue inside his heart he needs to take antibiotics before each visit to the dentist. This is one reason I am not pleased with those who feel they should be free to spread vaccine preventable diseases to the rest of the population, including my medically fragile child. Nowhere did it say these kids with ASD are un- or under vaccinated. Kids with ASD can have immune systems differences and other chronic conditions so while .8% higher than a typical kid, only .2% higher than kids without ASD but with chronic health issues. With the immune system differences, this may just be a result of low-antibody production in kids with ASD. Irresponsible to link to parents not vaccinating. Parents who do that decide to do that do it way before any symptoms of ASD are apparent. I didn’t link this to parents not vaccinating. Could I invite you to read the above article? If you believe that it’s just autistics having a different immune system, the result is still the same: spreading misinformation about vaccines hurts our community. Building herd immunity is critical to those who are more susceptible to disease. And yet the autism parent community often does the opposite: spreading fear, uncertainty and doubt about vaccines. That all said: autistic kids *are* on average under vaccinated. Multiple studies have shown this. And their younger siblings are more likely to be under- or un- vaccinated. Which creates a pathway for diseases to be brought into the family. Which is not a good idea. Good grief that is terribly sad to read. I do hope we come up with better services to help all those with developmental issues, autism, etc. We really do not do them justice. Do you think this is related to mistrust of medical doctors in general, as in they don’t go to the doctor and then the issue gets worse and they need hospital care? Or is it something specifically related to autism? Perhaps I missed the explanation in reading the article. Has any medical researcher looked at this as one of the (many) reasons autistic children didn’t show up on the radar prior to the 1980’s? I would imagine that prior to WWII in this country at least, extensive co-morbidities would have led to the early deaths of most autistic children. Why would children with autism be hospitalized more for vaccine preventable diseases? Did their parents stop the vaccinations after their children received the diagnosis? Are parents who do not vaccinate more likely to seek an a diagnosis of autism for their children? Perhaps the dread of taking a child who reacts violently to the sight of a needle results in vaccinations being skipped? When I say violently, I mean the child may try to attack the nurse or his parents, though from my own experience this is more likely to happen in a blood draw than in vaccinations. I thought the debate about vaccinations and autism was long over. Is most of the refusal to vaccinate come from fear of autism or a reaction to a government mandate; i.e., even if the mandate orders me to do something for the good of my child, I won’t because I’m protesting the interference? Communication is a big problem, as is the child recognizing his body symbols. Constipation stemming from not going before the stool hardens because the child did not recognize the “have a bowel movement symbol”, or the child not eating until the hunger pangs become unbearable. Very often disruptive and self-abusive behavior has no antecedent. It happens solely because the child is autistic. Medications to address these behaviors do not have the greatest track record. When do disruptive behaviors result in hospitalization? I would hazard a guess that it is when they become so violent, that the safety of the child or its care givers is endangered. This is not to say the child is deliberately trying to hurt itself of anyone around it, but due to autism is no longer in control of its actions. Self-abusive behavior is usually associated with intellectual disability. I doubt my child could even formulate a thought about doing others harm, and yet teachers and others need to guard against such harm, not because of malice of forethought, but due to uncontrollable behaviors. I mention this because the article mentions these things as somehow preventable. Indeed other than hospitalization stemming from a failure to vaccinate, how many of the problems truly stem from the failure of caregivers to take action? I would hazard that before a child is brought in for acute constipation over the counter remedies were tried. Does the answer mainly lie in better educated caregivers, or do these hospitalizations primarily stem from autism itself, and no matter what a parent does, they are bound to happen. It is also true that even if you have actually had the disease, you do not have a lifetime immunity. Because neither inoculation nor infection guarantees immunity, besides having the child vaccinated the CDC also recommends. Make sure everyone around the infant is immunized. This includes parents, siblings, grandparents (including those 65 years and older), other family members, babysitters, etc. They should be up-to-date with the age-appropriate vaccine (DTaP or Tdap) at least two weeks before coming into close contact with the infant. Unless pregnant, only one dose of Tdap is recommended in a lifetime. These two strategies should reduce infection in infants, since health data have shown that, when the source of pertussis could be identified, mothers were responsible for 30-40% of infant infections and all household members were responsible for about 80% of infections. It is also true that many adults in which the complications are much less severe do not know they have the disease. This all points to relying on herd immunity as being absurd when it comes to pertussis. It is foolish for any disease for which we have vaccinations, but rises above that for pertussis. It should be pointed out, both ASD and non ASD children with chronic diseases, have very similar rates of hospitalisation for vaccine preventable diseases; the difference of 0.2% is tiny and could partially be due to error limits within the diagnostic and data collections. Also, vaccines have stated failure rates; some, like mumps are admitted to wear off over time. It would be very wrong to assume the 0.2% difference is due to non vaccination of ASD children. ASD children suffer from a catalogue of co-morbidities, in particular epilepsy and gastrointestinal disorders; the latter has been put ats high as 70%+. Many of these children are physically debilitated, making them, in common with non ASD children with chronic diseases, more likely to be hospitalised from infections. I do not discount either comorbid conditions nor the risk from vaccine preventable diseases. It’s sad to see you try to downplay the risk of vaccine preventable diseases. The intense focus placed on vaccines by a minority of vocal parents has and continues to cause harm to the autism communities. It is as bad or worse than Bettleheim’s “refrigerator mother” theory in terms of causing us harm. The fact that autistics are more likely to be hospitalized for vaccine preventable diseases is just the most direct example of how we harm our own community. And this ignores the harm to public health autism parents have caused. We are very (VERY) lucky that the backlash to our communities has been minimal. With such a concerted effort to spread misinformation, fear and doubt about vaccines from some vocal members of our parent community, it would be very reasonable for the public to wonder why they should support such an irresponsible group. Thankfully the public keeps their eye on the real focus–autistics–and not on the parents who are so brazenly irresponsible. As to GI complaints. The attempt by Andrew Wakefield and, again, a group of autism parents to link GI disease and vaccines set back efforts to help our community. While GI disease is more prevalent in autistics, the 70% estimate is high and very dependent on definition. If one considers Lisa Croen’s team’s recent work one finds that about 35% of adult autistics have GI diseases. And that’s 1.3x higher than the general population. 30% is significant and we should be supporting this segment of our community, but making overblown claims of extremely high prevalence doesn’t do us service. Then again, I try to stick to facts and not politics. When I see a community exaggerating, I tend to discount the rest of what they say. The Lewin Group team found about 20% of autistic children had GI complaints. As with Croen’s group, this is based on medical records, not a survey. They grouped GI complaints together with nutritional issues (which include allergies) so the number is a bit fuzzy. This was about 4x more prevalent than the general population, so, again, well worth considering. And well worth not continuing to shoot ourselves in the foot by trying to link this to vaccines. You will also note (and likely discount) that infectious diseases were 1.88 times more prevalent in autistic children. But I doubt that will stop you from discounting the need in our community for the prevention of diseases with vaccines. Both the Lewin Group and Lisa Croen’s group found that psychiatric conditions were VERY VERY much more prevalent in the autistic population. In children, the Lewin Group found mental health conditions to be 24 times more prevalent in autistic children. 24 times. Croen’s group found anxiety, depression, bipolar and schizophrenia all to be highly prevalent in the autistic population. Schizophrenia was 22 times more prevalent. But the parents pushing the idea that vaccines cause autism ignore these factors. They try to lay claim to be the only group that cares about comorbid conditions while ignoring the most prevalent comorbid conditions. Why? Because they can’t link them to vaccines. My guess is you are unaware of the recent study on inflammatory bowel disease and autism. This is the GI complaint that Andrew Wakefield claimed (lied) was present in almost all autistics. Want to guess the actual prevalence of IBD (expert verified) and autism? About 0.25%. You claim that 0.2% is “tiny”. If you were consistent, you would think that the prevalence of IBD in the autistic population is “tiny” and downplay it. I do not. It’s small, but our community is based on defending the rights and needs of a minority. So, thank you for an example of what is wrong with autism parents. Sullivan (Matt Carey) seems to have made a huge number of assumptions about both me and my post!! This is ‘extrapolation’ at it’s most extreme. This was my first comment ever on this website, and contained no personal information or opinions about vaccines, other than the officially admitted information about the MMR mumps component, (stated by Dr Paul Offit ‘to wear off after around 10 years’) and the officially stated vaccine failure (and risk) assessments, found on all vaccine inserts and government health web sites. To clarify, (AGAIN), Dr Carey made the point, ASD children are three times more likely to be hospitalised for vaccine preventable diseases than normal healthy children. This is hardly surprising. As I pointed out ASD children have high levels of co-morbidities (something we all agree on) and a better comparison would be with non ASD children with chronic medical conditions. In this case 1.2% for ASD and 1.0% for non ASD with chronic conditions. Scientifically, these two data sets are almost identical for the reasons I explained earlier. Dr Carey makes no bones about blaming parents of ASD children who land up in hospital with ‘vaccine preventable’ diseases. His assumption seems to be parental failure to vaccinate their children. But Dr Carey, illogically, places no blame at all on the parents of those non ASD children with chronic conditions who are also hospitalised with ‘vaccine preventable’ diseases.’ The reality is probably nothing to do with vaccines, but related to both sets of children’s co-morbidities. Immune compromised children, for example those on chemotherapy, cannot be vaccinated. ASD children receiving treatment for asthma, are also immune compromised, making them more susceptible to attenuated live viruses in some vaccines. The data on the table (above) does not provide any breakdown of which vaccine preventable diseases were contracted by the children. There is also no data provided about whether or not the children were vaccinated beforehand. Without this information, it would be inappropriate to apportion blame to parents for alleged failure to vaccinate. For the record, I am not an ‘autism parent’. I have a now adult autistic grandson, who suffers from epilepsy and gastointestinal disorders. He was fully vaccinated according to the UK child vaccination schedules at the time, including MMR and DTaP. I’m not sure how relevant Lisa Croen’s stats on adult ASD are but the following assessment from the American Academy of Paediatrics admits the enormity of the ASD GI and other problems. Instead of apportioning blame, let’s get this sorted. I do not practice medicine. I hold a Ph.D.. Referring to me as “Dr. Carey” here is not appropriate in my opinion. I make no assumptions about you. I read your comment and from there generalized to one of the largest problems in the autism communities–the way a small minority of autism parents spread misinformation about vaccines and how that harms not only the entire community, but our own community. Fairly classic attack method used by people who are antagonistic towards vaccines. Build a straw man argument and try to use disabled children as a shield. In no place do I blame parents of ASD children who end up in hospital with infectious diseases. Not that I expect you to correct or admit your mistake. After years of doing this I note that admitting mistakes is pretty much never done. I’ve spent many nights in the hospital with an autistic child fighting infectious disease. Diseases that most people shrug off without much distress at all. What will happen with a really serious disease like measles? I don’t want to find out. Let me repeat that for emphasis–I do not want to find out. So, let’s get back to your attack–that I blame myself and other autism parents. Don’t use my kid as your shield. Not when you are part of the problem. Not when you are part of what is putting him in danger. Parents who have to suffer through going to the hospital are not the ones to blame. Parents who promote fear and doubt about vaccines are. Yes, I include you in that. Because you *are* part of the problem. I hope that’s clear. Not that clear arguments ever get through to the vaccine antagonistic. When presented with a clear argument you tend to resort to attacks. Like you just did. To clarify (AGAIN)–this is why the actions of vaccine antagonistic factions within the autism communities hurt autistics directly. That’s not too hard but somehow you want to avoid addressing it. The incidence of vaccine preventable diseases is low at present. And yet autistics suffer more than the general population. You either don’t understand the point or are trying to divert attention from it. More autistics suffer from vaccine preventable diseases, ending up hospitalized. What will happen if the efforts of those who are spreading misinformation succeeds? What happens when 20%, 30% or more of autistics are being hospitalized? Is that what we want to be working towards? All based on the failed idea that vaccines cause autism? I apologize from limiting the irresponsible behavior to autism parents. Yes, autism grandparents are also a problem. I would sincerely encourage you to spend the time to work out how relevant it is. Also, don’t ignore the stats on autistic children (which you appear to be doing). GI disease is *not* as prevalent in autistics as those who claim the Wakefield/MMR causation theory believe. This is especially true for inflammatory bowel disease. And all this avoids the main point–why is it that you and other only focus on a minority of lower-prevalence comorbid conditions? You only seem to think important the comorbid conditions which (erroneously) you feel support the idea that vaccines cause autism. Mental health conditions. Neurological conditions. Other conditions are more prevalent than GI disease. Matt Carey states :- “I make no assumptions about you” Really? The 1998 Wakefield et al Lancet paper, involved 12 ASD children, with gastrointestinal disorders. At that time the ASD GI connection was not recognised or acknowledged elsewhere. In addition to the Lancet 12, another 50 or so children were diagnosed with the same disorder by the Royal Free Team, led by distinguished paediatric gastroenterologist Professor Walker-Smith. One of those ‘other’ children was my grandson, who benefited greatly from the treatment regime requiring therapeutic intervention and medication. Professor Walker-Smith’s medical licence was restored by Lord Justice Mitting following his High Court Appeal during February 2012. Judge Mitting had some scathing comments to make about the GMC’s ‘superficial and inadequate’ and often just plain WRONG examining of the evidence against the three doctors, mostly supplied by Brian Deer, who also managed to make money at the same time by writing about the case in The Times and Guardian -STRICTLY forbidden in REAL UK courts of law, but the GMC was what we Scots call ‘a wee pretendy court’. NO MORE . Justice Mitting made it very plain there were to be no more three year ‘inquisitions’. The new GMC format is less formal and follows industrial tribunal guidelines. The GMC NEVER challenged the veracity of the 1998 Wakefield et al Lancet paper’s findings or conclusions. The hearing was about alleged ‘ethical’ transgessions. Dr Wakfield NEVER claimed -anywhere- that ALL autistic children had GI problems, but he was perfectly correct to identify an ASD GI link. 17 years ago this was considered ‘novel’. NOT ANY MORE -as Dr Carey’s above article makes clear. Legal warning, as Willingham did, to publicly put the record straight or be sued for slander. “And all this avoids the main point–why is it that you and other only focus on a minority of lower-prevalence comorbid conditions? You only seem to think important the comorbid conditions which (erroneously) you feel support the idea that vaccines cause autism. You appear to be assuming that I’ve never read anything else you have written in internet discussions. That I base my statements solely on what you’ve written here. And, even if that were the case, my assumptions are correct. You did. I don’t want to go around and around in circles with you on this one. You decided to come here and say that a larger risk for autistics getting hospitalized is “tiny”. Even if we took your abuse of statistics, it’s a 20% larger risk. But you chose to compare autistics to people with chronic conditions, which was a way of minimizing the risk that you and your colleagues are trying to foist upon the autism communities. And now who is making assumptions and putting words into someone’s mouth? You make the assumption that I’ve never read anything you’ve written elsewhere on the internet, by the way. Really? No where on the internet, at any time? I would disagree with you there. You do appear to be unaware of the recent study in that you keep trying to link autism and GI disease to Wakefield. Wakefield’s theory was solely based on inflammation. Not all GI disease is inflammatory. In fact, most is not. I really do not understand why you and others hold that man in such high regard. Leaving aside the fact (and proven fact it is) that he is unethical, leaving aside the fact that he lies over and over, leaving aside that his actions are highly responsible–he has done ZERO for the autism communities. Prove me wrong. What therapies has he introduced, developed or proved to be effective. (Answer: none). How many autistics has he treated (legally: none. He’s never had clinical responsibility). Yep, he’s been antagonistic towards vaccines. And for that a small segment of people love him. But when it comes to actually accomplishing something of value, there’s nothing. He was at best a mediocrity. But mediocrities can actually do good. He threw that away. Again–you put *all* people with chronic conditions at higher risk of hospitalization with your actions. And somehow you think this is a good argument? Never said he did. I did say that he claimed that a large fraction had inflammatory GI disease. He even went on to claim it was a “new syndrome” and was linked to regression, and that it was linked to MMR. And he was wrong, wrong and wrong. I would suggest you actually read what Mr. Wakefield has written, because even he has acknowledged that others discussed GI disease in the autistic population before him. So, you advocate *against* treating autistics. Ironic that. Your comment belies your assertion–you do, in fact, downplay the role of comorbid conditions and autism. Just because someone is autistic does not mean that s/he should be denied care for a comorbid psychiatric condition. You go so far as to advocate against treatment. And that’s supposed to be a good thing? I certainly don’t represent Dr Wakefield’s legal interests. (Yes-he’s still a qualified medical doctor -one thing the GMC couldn’t take away from him). These days Dr Wakefield is perfectly capable of taking care of himself and has friends in high places. Any ‘legal’ communication would come straight from him. He has resided in Texas with his family since 2002, when he was hounded out of his Royal Free research position. I’m not a lawyer but “present in almost all autistics.” is decidedly different from “a large fraction”, the latter is now admitted by the AAoP to be the case, which proves Dr Wakefield was right all along….and didn’t ‘lie’. He deserves an apology. I’m fed up of this thread, full of snide ad hominem comments and twisted semantics . I will leave you all with this ‘food for thought’ coming as it does from your own CDC, a nice new easily administered SINGLE measles vaccine in the pipeline. Dr Wakefield would applaud. That’s EXACTLY what he advocated all those years ago. Hence my rhetorical question, the point of which is that you shouldn’t be making legal threats on his behalf. It’s a bit childish to threaten someone but hide behind a third person as you just did. Sort of the “my big brother can beat you up” sort of childishness. But let’s not focus on the childish aspect of this–the important point is that you were making threats. Pretty classic behavior from your circles–trying to bully others. Threats, insults, personal attacks, lies–all the standard arsenal of the vaccine-antagonistic. We have very different definitions of “qualified medical doctor”. Without a license, one is not qualified to practice medicine. When was the last time he saw a patient? To my knowledge he was never licensed here in the U.S.. If Mr. Wakefield were the last medically trained person on earth, he would not be allowed to treat anyone in my family. A degree from a medical school doesn’t mean anything when a person has repeatedly demonstrated unethical behavior and a lack of reasonable thinking. The GMC hearings and findings showed the multiple unethical actions of the man. His arguments on vaccines (and his attempts to hide his unethical behavior rather than showing the courage to admit his failings) shows the lack of reasonable thinking. Acting unethically is in my book also a lack of reasonable thinking. You are correct: he does have friends in high places–if you count deep pockets as “high places”. Somehow he appears to have pulled in over a half million US$ for his Strategic Autism Initiative. How much of that resulted in a benefit to the autism communities? Whoever supported that “initiative” didn’t do much more than support Andrew Wakefield. Which may have been the point. Being wealthy doesn’t make one immune to being fooled. I do have to ask–is your “friends in high places” statement another threat, though? I thought he left Texas. He lost his job there and had his house for sale years back. Hence the youtube video of his house. His organization (Strategic Autism Initiative) is based out of California if I recall his recent tax records. I don’t follow his personal life, just his actions. He’s been here in my state (California) a lot lately, failing to lobby against a law that has nothing to do with helping autistics. So he didn’t move here? He’s just speaking out against our proposed laws? But, again, no idea where he lives. Don’t care, really. I doubt Mr. Wakefield reads my statements, so I doubt that’s he’s unhappy with them. I don’t write to make him happy or unhappy. I don’t expect him to read what I write. I write to express my opinions and observations. Mr. Wakefield speaks out with misinformation because he is expressing his protected right to voice his opinion. Doesn’t matter if his opinions are poorly reasoned and not supported by evidence. If he can exercise that right without evidence, am I not allowed to voice an opinion? Or did he come to the U.S. to try to quash discussion? Didn’t a judge in the UK state that Mr. Wakefield uses the courts to try to gain PR? Let’s see–the rate of identified autism has gone up a great deal in the past few decades. If MMR were contributing, in the way his model states, there should be a lot of inflammatory bowel disease in autistic children, shouldn’t there? Not a fraction of a percent, but a lot. Large fraction/almost all. If my changing those phrases seems like some sort of debate win on your part, well glad you had fun with it. Not a qualification, just a different way of stating the same thing. I don’t care if you are fed up with this thread. I am fed up with unethical people like Andrew Wakefield. As to your last point–do you speak for Mr. Wakefield or do you have a public statement you could point to that says he supports this new vaccination technology? I would love to see him say that he supports it. I wouldn’t bet a dime on him voicing support for vaccines of any sort, but I’d love to see it. So Jeffiner Allan, are you going to correct them? Now that you know that “large percentage” is less than 1%? Or is mincing words over “almost all” and “large fraction” just for trying to win some silly internet debate here? In other words–do you actually care about the facts? Because I doubt it. Where is he legally allowed to practice medicine? Also, has he ever had the official training qualifications to work with children? By the way, the MMR vaccine was first introduced in the USA in 1971. If it caused as much autism as was attributed to his claims, it would have been seen in the USA, which is much larger than the UK and was using a form of the vaccine almost twenty years before three versions were introduced in the UK in 1988. Can you please provide the verifiable documentation dated before 1990 that there was a noticeable uptick of autism cases in the USA during the 1970s and 1980s? Because without this data we will assume Wakefield made it all up as he doctored the data of his now redrawn 1998 Lancet article that he wrote to appease lawyer. And when you do come up that documentation, please be clear what version of the DSM was being used. Apparently DSM II is very different from DSM IV. What part of “globally” did you not understand? It ain’t for the good ol’ USA where there is adequate electricity for refrigeration. I seriously doubt that Wakefield has kept up with his CMEs….he’s been too busy raising funds for movies that never get made & he’s certainly never been held accountable for the usage of any of the money that he has been given over the past decade (though by the size of his estate, I can guess where it went). And if this new vaccine delivery system helps in the global campaign for eradication (and now that we’re seeing a mass outbreak in the Congo, this can’t come soon enough), all the better. I agree with Matt here – you are doing a disservice to a community that badly needs more research into more effective interventions and services – the attempts to blame vaccines for autism has siphoned huge amounts of funds of attention that could have otherwise been put to good use. I certainly don’t represent Dr Wakefield’s legal interests. (Yes-he’s still a qualified medical doctor -one thing the GMC couldn’t take away from him). These days Dr Wakefield is perfectly capable of taking care of himself and has friends in high places. Which is why he’s been reduced to appearing on the “Conspira-Sea” cruise, of course. Any ‘legal’ communication would come straight from him. And who can forget the last one? Science is wonderful isn’t it?You do have to wonder how much of the reason for developing this microneedle patch was also to develop a type of vaccine delivery system that might appeal to antivax parents.I can’t wait to see how the loonies at Age of Autism and Thinking Mom’s Revolution explain how such vaccines would be toxic. And this has what to do do with Andrew Wakefield,exactly?